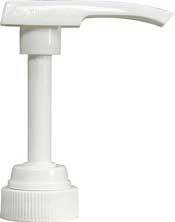 This pump snaps into place on the 750ml Monin syrup bottles. Simply press down to dispense one � oz "shot" of syrup into your drink. This pump remains in place and replaces the cap.